I found a smart looking single breasted peacoat that’s currently on sale for only $85, and it’s normally $195! Just use code WINTER to save 20% off starting tomorrow. 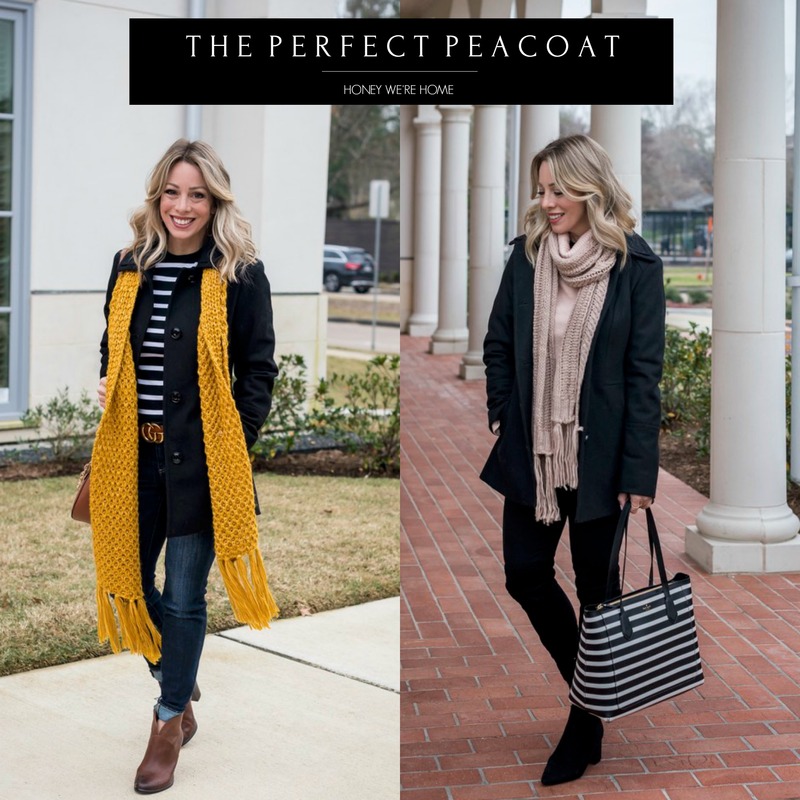 I styled this perfect peacoat for you two ways so you could see how you can wear it with blue jeans (mixing in brown) or black jeans or slacks. The star of this show is the warm, great quality peacoat that looks as good with jeans as it does for dressing up and heading to the office. The single-breasted sleek style is both modern and polished and I also like the length. The coat is lined but doesn’t feel bulky and the pockets are a bonus. I chose the black coat since I knew it will go with everything, but it also comes in navy, dark grey and a fun merlot color. I’m wearing it with jeans in both styles, but it would also be perfect over a dress or with a skirt. PEACOAT FIT : I ordered the XS and the XXS and ended up going with the XXS for a more tailored fit. I’m 5’1, about 110 for size reference. I like to show you multiple ways to style the things in your closet, so I created two looks for this one. 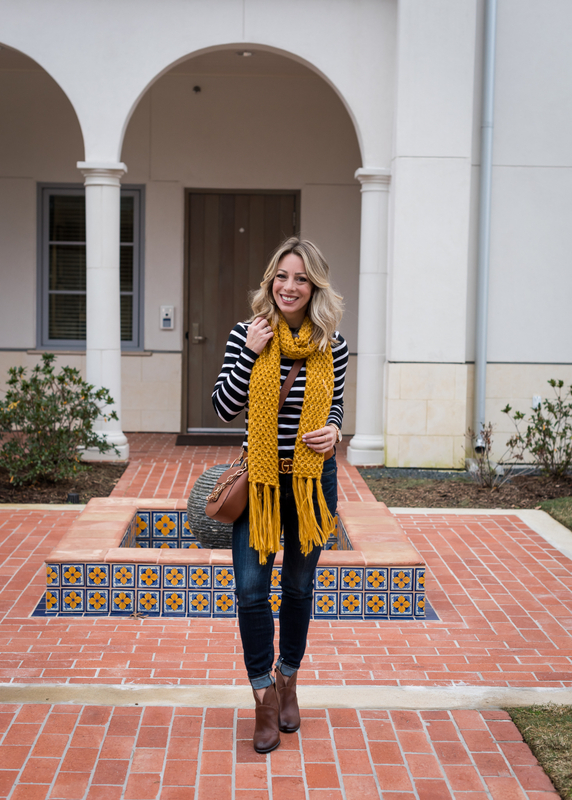 First up, is with dark denim jeans, a black and white striped tee with brown booties and a yellow scarf. I wanted to show you how easily you can pair black and brown in case you’re not sure about that. You could go with any color scarf, but the yellow really helps cheer the outfit up! It’s a chunky knit with fun fringe and comes in more colors too. p.s. It’s on sale for only $28! I ordered two bags for this outfit, but this one was the winner. The color is a rich cognac and the gold hardware gives it a little pizazz. The chain link handle and crossbody strap are both detachable in case you wanted to only wear one. I don’t think I’ve ever met a striped top I didn’t love. 😉 But how cute is this one with the three button detail at the shoulder?! Next, I put on a pair of black jeans with a pretty pink cowl neck sweater and coordinating scarf, then finished the look with a cute striped bag. Blush pink is a universally flattering color and this sweater is nice and cozy and warm. I liked the cable knit detail on the sleeves and loose cowl neck style. 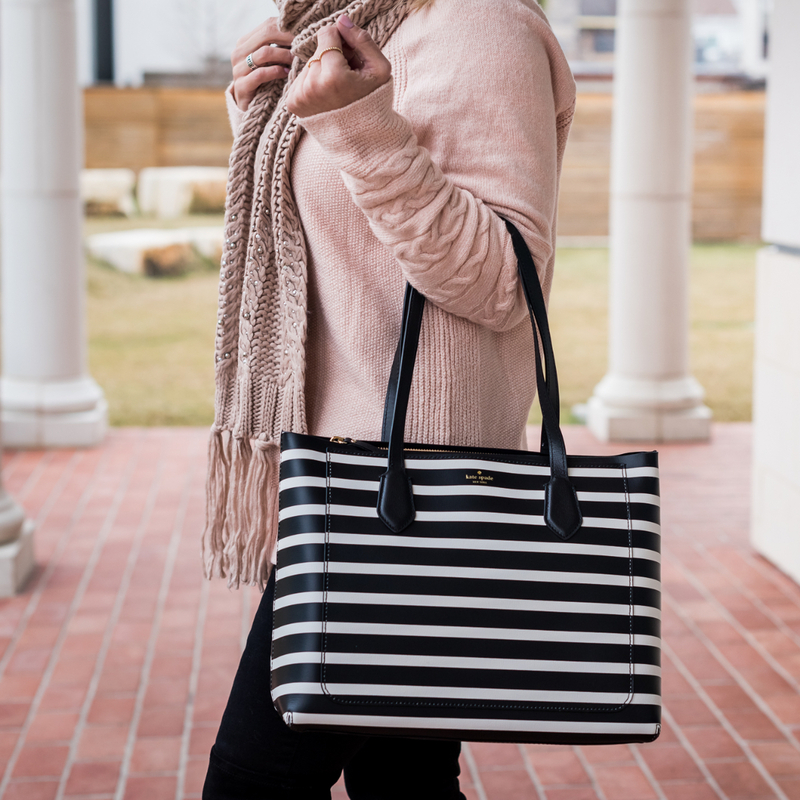 When I saw this striped Kate Spade bag online, I scooped it right up! Years ago, I had a similar canvas style bag and I wore it all the time. This one is her leather sister in a medium size (13w x 10.5h) with 9-inch handles. It zips close and has one interior pocket and one slip pocket to help keep you organized. I thought y’all would really like this one! I went tone on tone with the blush pink sweater and scarf – but if you look closely, you’ll see the scarf has little beaded accents to dress it up. It comes in white, charcoal and grey and you can save 20% using code WINTER tomorrow. I never thought I needed a peacoat until I tried this one! I always wore my packable jacket when it got cold enough for it, but I like that this coat looks more polished and put together. What do you think?! Hope you have a great day friends!